Now I'm a big fan of the diamond. I know they're overpriced and much of that is related to the hyperactive marketing of the gem, but darn it, they're pretty! And, I'm a big fan of flower designs, so this headline got me all kinds of excited! 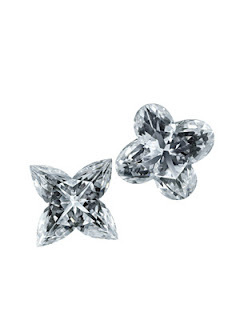 Now Louis Vuitton has gone and patented two new cuts of diamonds in flower shapes based on the monogram flowers that appear on their luggage and bags. I know all the work that goes into cutting any type of gemstone, so the time it takes to make these beauties just right may very well justify the astronomical price tag: a necklace containing 108 carats of this cut of diamonds is retailing $4 MILLION. Reason, Season or a Lifetime?